Not a king, but a priest whose power grew through several reigns. A predecessor of Kerdir called Tosar had begun collecting and organising the hymns that were eventually written dlown to become the Avesta. What we known of the religion at this time: Kerdir was organising the priesthood and its training; he was establishing a body of law, whose judges were now to be priests. He was standardising religious practices: Ahura Mazda (Ohrmazd) was the chief god, but Anahita and Mithra were also honored. Sacrifices of meat, bread and wine were made to the souls of the dead. Separate major fire-temples were established for the three classes - priests, warriors and 'the rest'. A hierarchy of priests was set up - from the Mowbed (chief magus) down to Herbed (teacher-priest), who looked after the small fire-temples in the countryside. His successful career - promoting Mazdaism and persecuting its rivals. And from province to province, place to place, throughout the empire the rites of OhrmAzd and the gods became more important and the Mazdaean religion and magians were greatly honoured in the empire and great satisfaction befell the gods and water and fire and beneficent creatures, and great blows and torment befell Ahriman and the demons, and the heresy of Ahriman and the demons departed and was routed from the empire. And Jews and Buddhists and Hindus and Nazarenes and Christians and Baptists and Manichaeans were smitten in the empire, and idols were destroyed and the abodes of the demons disrupted and made into thrones and seats of the gods. the rites and the Mazdaean religion, which are now performed among the living, and henceforth let him not be at all disobedient. And they should know for certain that there is a heaven and there is a hell, and he who is virtuous goes to heaven and he who is sinful is cast into hell, and whosoever may be virtuous and behave well with regard to good deeds, renown and prosperity will fall to this his material body and blessedness accrue to his durable soul, as it fell to me Kerdir. When Kerdir was Mowbed, religious leadership, which had been in the hands of the king since Achaemenid times, began to pass to the Magi, who, with their training colleges, became self-perpetuating. This was a very significant transfer of power, which was to have important consequences. Religious authority became separate from political authority, which it soon felt strong enough to challenge. He also continued the process of collecting religious texts and standardising them - so there could be no argument. Eventually these texts became the Avesta, the sacred book of Zoroastrianism. Was Iran acquiring a national church? NEXT: WEAK KINGS: WILL THE EMPIRE OF ARDASHIR I AND SHAPUR I SURVIVE? Kerdir single-handedly creates the basis of a "church" of Mazdaism. For worship of Ahura Mazda earlier under the Achaemenids, look here. Kerdir had been influential under Ardashir I and Shapur I, but he was made Mobed (Chief priest) by Shapur's son Hurmazd I (AD 272 -273) and given even more power by his brother and successor, Bahram I (AD 273 - 276). In AD 276 he had his great rival Mani arrested, tortured and killed. He was still Mobed under Bahram II and Narseh. The Iranian title meaning chief priest. The title of "judge" suggests that law was now considered a matter for priests. 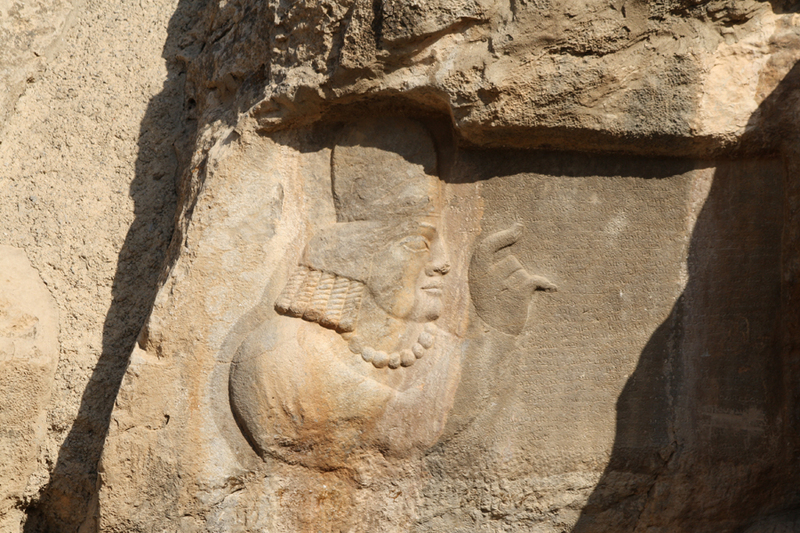 The fire temple of Anahid (Anahita) in Istakhr was the most important religious site in the Sasanian empire. The kings' ancestors had been priests there - and Istakhr was still the largest and most important city in Persis. Another form of Ahuramazda or Ahura Mazda, the Wise Lord. Kerdir sees Ahura Mazda and Ahriman as opponents in a dualistic sytem, although each is supported by other gods, or demons. Magians or Magi were the priests and controllers of Mazdaism. 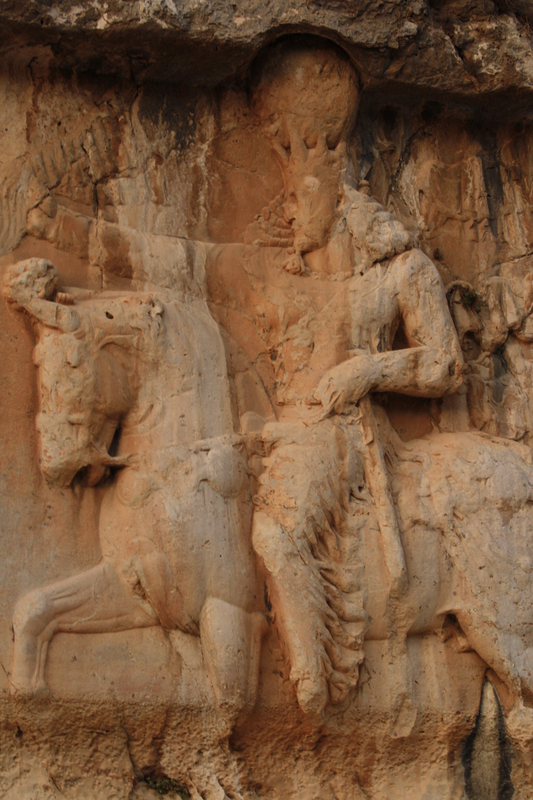 Kerdir is now responsible for their selection and training: they were to become an increasingly powerful force within Sasanian society, and sometimes a challenge to the king. A fire temple (such as the possible temple of Anahita at Bishapur) contained both elements, which are both sources of purification. This persecution appears to be a personal "crusade" by Kerdir, rather than a necessary part of Mazdaism. Christians continued to be persecuted, with varying enthusiasm, under later Sasanian kings. This was because, after Constantine made the Roman empire Christian in AD 313, the Sasanians saw Christians as enemy agents. Later still, when eastern Christianity fell out with Orthodox Christian doctrine, they became quite acceptable. This Mazdaean belief in reward or punishment after death in separate places (heaven and hell) was very influential - finding its way into Judaism, Christianity and Islam. The stress on "good deeds" is also crucial. Zoroastrians are expected to play a full part in community life - no skulking in monasteries, or going off alone into the desert to be nearer to god (both activities which were to be become important in Christianity). Celibacy was thought absurd - they had no truck with the self-denial of Manichaeans or Christians. There were still different kinds of Mazdaism, though. The most influential was Zurvanism - where Zurvan was the supreme god, father of Ahura Mazda and Ahriman.